Here's another easy spider decoration for your Halloween party with alot of fun pizazz. 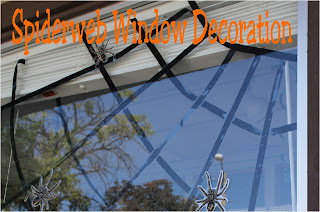 Since the electrical tape is on black on both sides, it doesn't matter if you make your spiderweb on the inside of the outside of the window. But start with a sunshine half circle. It's your decision on how big to make it. Next, string the electrical tape into "rays" coming out from your sunburst. Finish it off by string the tape between the rays. The electrical tape is pretty easy to turn and is very forgiving if you don't like how it looks. The spiders are sticky only on the bottom, but are pretty cool looking from both sides. Finish off your spiderweb by placing the spiders in random spots around the web. It's starting to look a little like a spider infestation around here. I admit, I love it. I'm not sure Dear Hubby will come visit me anytime soon, but it's still pretty fun to look around at all the fun props.